For some ideas of harm, look at Figure 1-8, taken from Willis Ware's report. Although it was written when computers were so big, so expensive, and so difficult to operate that only large organizations like universities, major corporations, or government departments would have one. Ware's discussion is still instructive today. Ware was concerned primarily with the protection of classified data, that is preserving confidentiality. In the figure, he depicts humans such as programmers and maintenance staff gaining access to data, as well as radiation by which data can escape as signals. 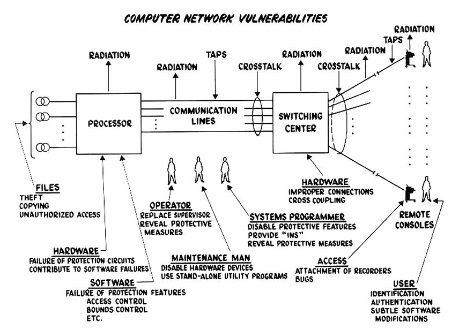 From the figure you can see some of the many kinds of threats to a computer system. One way to analyze harm is to consider the cause or source. We call a potential of harm a threat. harm can be caused by either nonhuman events or humans. Examples of nonhuman threats include natural disasters like fires or floods; loss of electrical power; failure of a component such as a communications cable, processor chip, or disk drive; or attack by a wild boar. Human threats can be either benign (nonmalicious) or malicious. Nonmalicious kinds of harm include someone's accidentally spilling drink on a laptop, unintentionally deleting text, inadvertently sending an email message to the wrong person, and carelessly typing "12" instead of "21" when entering a phone number or clicking "yes" instead of "no" to overwrite a file. These inadvertent, human errors happen to most people; we just hope that the seriousness of harm is not too great, or if it is, that we will not repeat the mistake. Most computer security activity relates to malicious, human-caused harm: A malicious person actually wants to cause harm, and so we often use the term attack for a malicious computer security event. Malicious attacks can be random or directed. In a random attack the attacker wants to harm any computer or user; such an attack is analogous to accosting the next pedestrian who walks down the street. An example of a random attack is malicious code posted on a website that could be visited by anybody. In a directed attack. the attacker intends harm to specific computers, perhaps at one organization (think of attacks against a political organization) or belonging to a specific individual (think of trying to drain a specific person's bank account, for example, by impersonation). Another class of directed attack is against a particular product, such as any computer running a particular browser. (We do not want to split hairs about whether such an attack is directed - at that one software product - or random, against any user of that product; the point is not semantic perfection but protecting against the attacks.) The range of possible directed attacks is practically unlimited.